Commodore CBM B720 Computer : Sie sind auch mehr schön. As mentioned on the page for the B128, the CBM-II models were Commodore's last effort to capture the business market with it's superior proprietary technology. All the machines in this line are distinguished by the MOS 6509 processor, Commodore BASIC 4.0 (like that found in the later CBM/PET computers, the Commodore "SID" sound chip, IEEE-488 peripheral compatibility, an RS232-C port, and 80 column text video capability. Seen here is the CBM 720, the European version of the CBM 256-80 HP computer. The 720, being a high- profile model, also includes the ability to attach an optional 8088 or Z-80 coprocessor board, as well as the crisp built in display. A full 256k of banked memory is also included, which BASIC fully supports for variable storage. 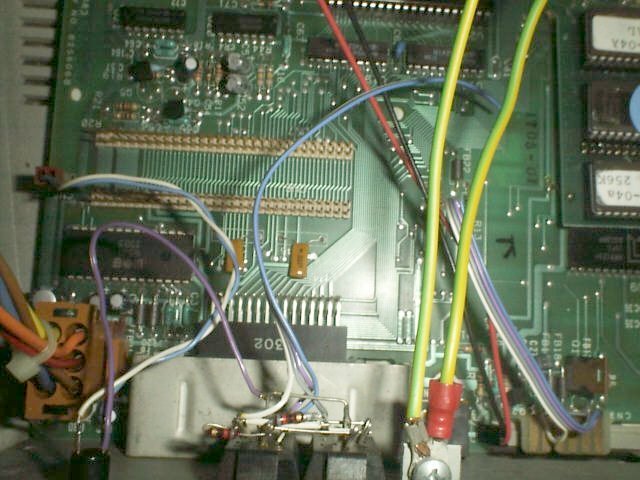 This particular 720, for some reason, appears to have the beginnings of a pair of IEC (Commodore Serial) ports worked into it. Check out the "back" view in the ports area below. Also check out the internal closeup view of the IEC wireing pictured just below (click on the image for an enlargement). The 720-D, shown here, is identical to the 720 except for the addition of dual CBM 8250 compatible mechanisms, with a full meg of storage capacity on DSDD 5.25" disks. These two models on this page represent the top of the CBM-II line. The stylishly curved plastic case with detachable keyboard and built in monitor are a contrast to the rest of the CBM-II models, giving them their "High Profile" distinction. Personal Note:I was astonished to finally get my hands on these beauties from eBay auctions.